When The Man arrived he and his entourage made a rock star’s entrance, with thumping music, and then we watched a supposedly visionary video about the “new” Independent, before he took the stage and the microphone. More magic available at www.zapiro.com. That evening I encountered a Newspaper House employee at a function. Manifesting scepticism he said that the essence of Dr Survé’s message to them was that if only they could emulate the astounding courage which had defined his life, their future careers in the company were assured. Shortly thereafter, News 24 published on its website, Dr Survé’s letter to the Indy staff. Being a man of his word, Dr Survé ensured that in the next few months almost a dozen of His Master’s Voice puff pieces were published in the newspapers he had bought with an apparently non-repayable billion rand PIC “loan”. Each of these imbongi articles eulogised the heroism of one of the world’s greatest business icons and most gracious philanthropists and they undoubtedly left the readers entranced, enthralled and bewitched by his charisma and visionary genius. The format of the puff pieces published in his own newspapers was simple. His editors, allegedly thirsting for information about South Africa’s answer to Warren Buffett, Carlos Slim Helu and Bill Gates, would prevail upon him to sacrifice time in his incredibly busy life – chatting to Prince Charles, counselling Madiba, having breakfast with the Clintons, regaling the great and the good at Davos – and then assail him with questions that were lighter than puff pastry. The pervasive consensus within our small journalism community was that most of these editors were not willing participants in this charade and we heard that some had implored him to desist. These grovelling imbongi articles did stop about a year ago by which time the controversy surrounding the “Fearless Leader” had reached such proportions that one read them with an increasing sense of mortification and growing empathy for those involved. Hardly a week goes by, however, without a photograph of the “Fearless Leader” being prominently published in in his own newspapers. He is, after all, a humble man. Leadership looked into this, and factually Dr Survé is right. Bafana Bafana won after his input for a record two years, culminating in the Africa Cup of Nations glory; the Indian team, hoisted (sic) by young Sachan (sic) Tendulkar, became the best cricket team in history; the Springboks won the most momentous World Cup in our national sporting history. Could the fact that he was firmly entrenched and involved in each of these be a mild coincidence? I find it very unlikely. To summarise: The input of Survé as a ‘firmly entrenched’ sports psychologist and “mind coach” played not merely a vital but a pivotal role in the success of the Springboks in the 1995 Rugby World Cup, the South African national soccer team which won the African Nations Cup a year later and India’s success in winning the Cricket World Cup in 2011. I know little about rugby and cricket but the latter claim seemed suspect to me because I know that India has a population of more than a billion people, that cricket is the national sport and that it is multi-billion dollar enterprise in that country. I therefore wondered why they could not find a suitable sports psychologist within their own ranks. So I turned to John Bishop, for 35 years the sports editor at my beloved journalism alma mater, The Witness. He has written biographies of Vince van der Bijl and Ian McIntosh, a book celebrating Natal’s first Currie Cup title win in 1990 and co-authored a book “Talking Balls” a collection of light-hearted sporting tales. He was named South African Sports Journalist of the Year in 1985 and Nissan’s Cricket Writer of the Year in the summer of 1991- 1992. Although now retired he continues to write a rugby column for the newspaper. John said that if Survé had played any role whatsoever in South African sport he was unaware of it and described the idea of him assisting the Indian team in 2011 as farfetched. “The first time I heard his name mentioned was when Chris Whitfield took early retirement shortly after Survé took control of the Independent titles”, he said. Coincidently, John had heard that Edward Griffiths was in South Africa and contacted him. A respected former sports journalist, he was the SA Rugby Football Union (SARFU) CEO in 1995 and was closely involved with the Springbok World Cup squad. At the time he came up with the memorable ‘One Team, One Country’ slogan. “I have no recollection of Iqbal Survé being involved in any way with the 1995 Springbok World Cup squad and, yes, you can quote me,” Griffiths said. There is another intriguing sentence in one of the above-mentioned puff pieces – headlined “The Man who wants to change the world” – published in Business Report two years later and he has never denied or distanced himself from this contention either. Some may say his claim to fame is that he was Nelson Mandela’s medical doctor on and off Robben Island. Another Google search revealed that Nelson Mandela had been transferred from Robben Island to Pollsmoor Prison in April 1982. Subtracting 1963 from 1982 indicated that Dr Survé was 19 years old when he was allegedly treating Mandela at the end of his imprisonment on Robben Island. He could, at the time, have only been in his first or second year of studies at UCT medical school. If, however, he was treating Mandela on Robben Island five years before he was transferred to Pollsmoor – say in 1977 – that means that Survé would have been attending to him in a medical context when he was only 14 and still at High School. Given the difficulties that an MP like Helen Suzman was experiencing in getting permission to visit Mandela, I am sure you will agree that that is a truly astonishing feat. As Lord Robin Renwick points out in his recent book “Bright Star in a Dark Chamber”, the National Party vacillated for years before granting permission for Suzman’s first visit in February 1967. Seven years were to elapse before they granted permission for a second, in October 1974. The bravery of this extraordinary young man must, thus, have had a profound impact on a justifiably grateful Madiba but, strangely enough, when Peter Flack asked him about Survé in 2000 – at the time Leisurenet was liquidated – Mandela said the name meant nothing to him. Like Tony Jackman and his colleagues, I had been told by Mr Survé that he had a very close relationship with Mr Mandela and, during my meeting with him, thought it might bolster the case for his intervention with Sir Richard to mention Mr Surve’s involvement. Mr Mandela looked puzzled and said he did not recognise the name even after I repeated it. I must confess that I was not surprised as, by then, Dr Surve’s somewhat controversial, erratic and unusual behaviour was an accepted fact. Mandela was hardly alone. Among the people and organisations who were unaware of the momentous role that Dr Survé played as a confidante of and medical consultant to Mandela were, according to Terry Bell, Ahmed Kathrada, Zelda le Grange, Dr Mamphela Ramphele and several doctors who are on record as having treated him as well as the Nelson Mandela Foundation and Amnesty International. Perhaps, then, the most remarkable achievement of the “Struggle Doctor” aka the “Teflon Doctor” is his ability to operate under the radar when it came to his highly-confidential relationship with Nelson Mandela – so confidential that not even Mandela himself was aware of it. In his correspondence with Terry Bell in this regard, Survé displays a touching and empathetic reticence. Furthermore, I am sure that you, having read the anchor quote to this article by Tony Jackman relating to what Survé said about Madiba in his opening address to the Indy staff, would never question his sincerity about not wanting to “flaunt” their close, caring and symbiotic association over decades. I had hoped that more details of the “Struggle Doctor’s” incredible life story would become known when he was scheduled to appear in the Labour Court in Cape Town in May to testify under oath about his contentious dismissal of former Cape Times editor Alide Dasnois. I was hoping that he would explain, within the context of Ubuntu, his kind offer to spend his “billions” to destroy her personal and professional reputation and do as much damage as possible to her future employment prospects. 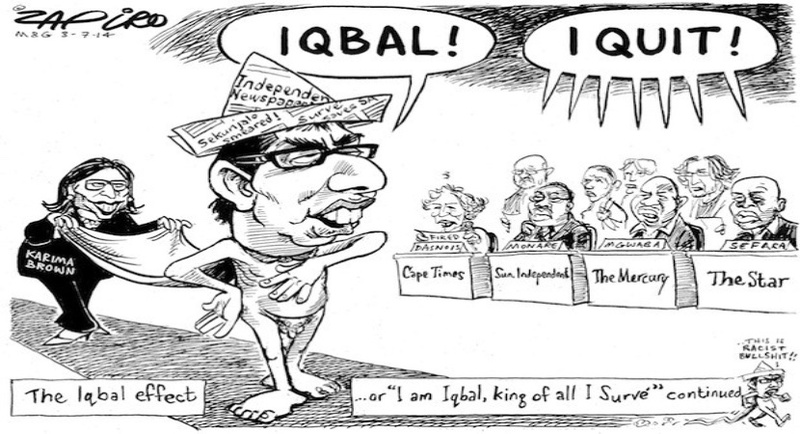 My hopes were dashed however when Survé “settled” at the last moment and I fear that, having once demonstrated his aversion to testifying under oath in a public forum, Terry Bell’s latest exposé might also scupper his threat to sue Cape Town human rights activist Rhoda Kadalie for defamation. 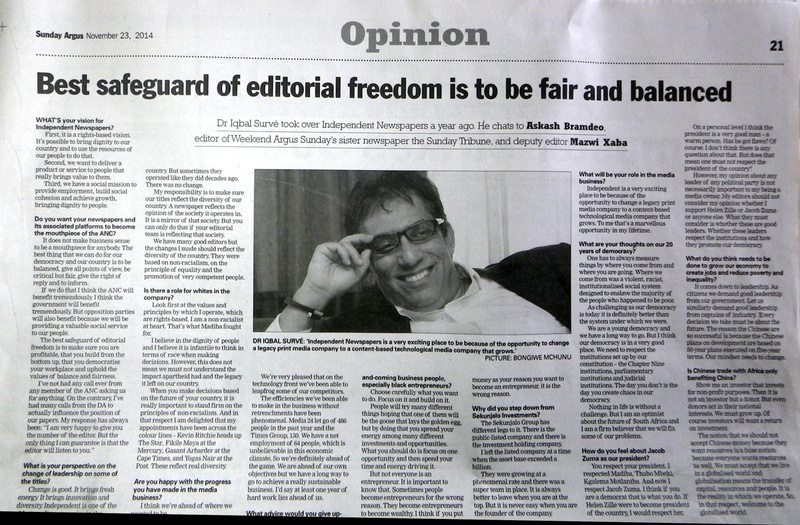 He (Survé) has given this assurance, and has committed to a new editorial charter that will define editors’ rights, obligations, and lines of accountability. Independent will be the first South African news group to operate according to such a charter, adherence to which will be overseen by an editorial advisory board of prominent and respected persons. Since then, however, “The Charter” has proved as elusive and as tangible as the dop system the Cape Times assured us – and Helen Zille – was still widely practised on Western Cape wine farms. This is unfortunate – “The Charter” might have prevented the regular Carlo Petersen racially-tinged debacles such as the Tiger Tiger Five race hoax, the Press Council’s resultant call for an apology and the lie he told (without sanction or any sign of contrition) about a lawyer having claimed in court that Dr Max Price had acted in bad faith. The lawyer, Peter Williams, later emphatically denied what Petersen had written and, in a letter to the newspaper, distanced himself from the dishonest sentiments expressed in the article. I shudder, however, at the thought of the vicious internecine warfare that is going to erupt as directors like David Lynch, Quentin Tarantino, Thomas Anderson, Hayao Miyazaki and others vie for the movie rights to Dr Survé’s forthcoming autobiography. The budget for this movie will, I confidently predict, obliterate current records. Will the faeces-flinging “revolutionary”, Chumani Maxwele, who has recently played such an immense role in the Cape Times, taking centre stage in front page lead after front page lead by reporter Carlo Petersen, get to star in the Iqbal Survé blockbuster, I wonder? Will the film withhold, as the Cape Times routinely does, the truth about Maxwele’s attempts to burn the University of Cape Town to the ground? One wonders too whether the movie will explore the allegedly close relationship that seemingly existed between the “Teflon Doctor” and the man whose Teflon eventually ebbed away, Brett Kebble. One hopes so because, for some unfathomable reason, this quite fascinating linkage has never been mentioned, let alone explored in any of the 17 newspapers that Dr Survé now owns. What is quite clear however is that any movie on the gallant life and chivalrous times of Dr Iqbal Survé will undoubtedly break all box office records and could well be more profitable than Avatar and Titanic combined. The billion-rand PIC-type loan question is whether Sekunjalo will outbid the Guptas for a slice of the action. That remains an open question but an even more intriguing question is whether the bid would come from Sekunjalo or the re-named African Equity Empowerment Investments. “Reputational damage” is much in the news at the moment and it is interesting to note that in November 2014 Survé resigned his position as executive chairman of the JSE-listed investment holding company, Sekunjalo. Whether purely by coincidence, Sekunjalo Investments Limited shortly thereafter changed its name to the anodyne African Equity Empowerment Investments Limited. Subsequent to Survé’s departure from centre stage, the non-executive chair, Prof. Vukile Mehana said this rebranding had had a very beneficial outcome: “The change of name has already had a positive influence on our organisation. There is a fresh level of energy, perspective and future focus,” he said. Any suggestion that this very profitable company, in changing its name, wanted to distance itself from what Peter Flack has called the good doctor’s “controversial, erratic and unusual behaviour” is of course malicious, mendacious and utterly devoid of truth – perish the thought and a plague on all your doubting houses! The final question: Will the winning director base his script on the Danny Kaye version or the Ben Stiller version? I will leave it to Twitter to have the last word. While we ponder the imponderable we look forward to the book and the resultant movie. I wish you – eventually – good reading and good viewing. Ed Herbst is a pensioner and former reporter who writes in his own capacity.